Oh hi … she’s not here. So me and my man Jeral thought we’d kinda help her out, if you had any questions or anything. Does she know? Well … no … but why would she mind, we’re helping. She’s getting all stressed out over judging Mog Madness. Muttering about the incredible weight, the responsibility of being a judge. Then something that sounds like … I don’t know … yoda or yodawg, whatever. Some kind of real world creature she has to battle I guess? I don’t know, you’d know more about that stuff than me. Anyway, she’ll be back. And really, you don’t want to be around her right now, such a drama queen. Yeah, see what I mean? So anyway, can I get you a drink while you wait? I thought it’d be nice to have an open bar while she’s gone. Just so we’d all have something to do until she gets back. I’m sure she won’t mind. Jeral says it’s no problem to run a tab for her. So, what can I get you? They just brought in a keg of Plugger’s Blackrock Ale, stuff’s hard to get. Let’s tap that and get the party started! Before … you know … she comes back. 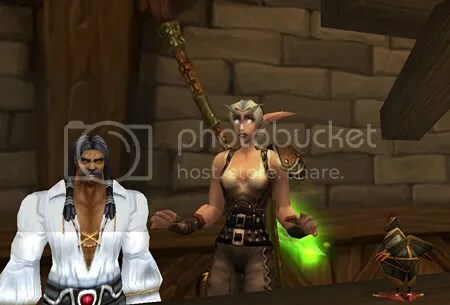 With my husband off work I’m not actually “playing” WoW much this week but I did download WoW Model Viewer to well, try on clothes. I know I said my druid wasn’t that interested in transmogrification because she’s rarely in human form but I just couldn’t resist. I had started collecting the Tier 4 set for her, the Malorne Harness because I think it looks good and I already had two pieces, but my heart’s not really in it. It’s lovely and shiny but isn’t what I think of my druid’s human form wearing. I put together a set of gear in the model viewer just going by what I think a druid would wear. Pictured above is one of many outfits I thought looked druidy. I picture druid’s gear as looking sort of outdoorsy and beat up. I mean all that shifting of forms and running around in the dirt has to take it’s toll. I didn’t pay attention to where the gear came from when I put it together. I didn’t realize just how hard it would be to actually get that look. The “must have” is the Bandit Jerkin but on looking it up it appears I’d have to spend a good amount of time finding, and then knocking off level twenty range rares which doesn’t really sound all that fun. The alternative is to hope it shows up on the AH. I looked up my next “must have”, Bael Modan Monnion, even worse. It’s a quest reward. I don’t remember if my druid did the new quests in the Southern Barrens, if not she’s in luck. I can see that this outfit is going to take some serious research on possible look alikes. Ah well, one must suffer to look one’s best. In other fashion news, my druid no longer has an excuse to do the BC fishing dailies. 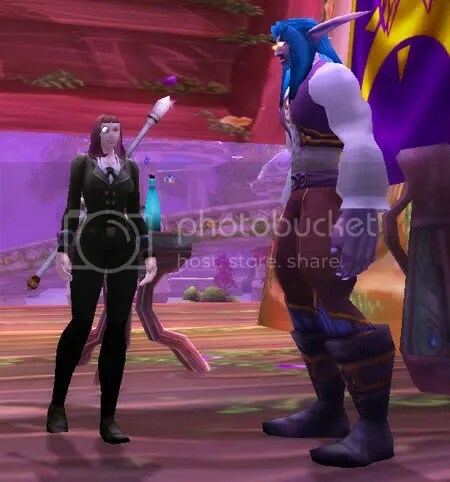 She finally got a Noble’s Monocle in her Bag of Fishing Treasures so my bank alt is tricked-out in everything she wanted now, down to the Antique Silver Cufflinks. Geez, who knew being fashionable was going to be so challenging. Hmm, maybe after The WoW Ironman Challenge is over I could begin a Fashion Challenge where I try to actually complete that set!